Four Seasons01263 715779work01603 870304fax Self-cateringFour Seasons is a delightful detached property in a stunning riverside situation , just a short distance from Norwich city centre and the Norfolk Broads. The house accommodates up to 12 guests but discounts are available for smaller parties of 8 or 10 who wish to benefit from this lovely property and its location. Luxuries: Wide screen smart TV, Blu-Ray Player, WiFi. General: Gas fired underfloor heating. Utilities: Range master double electric oven and gas hob, fridge, dishwasher, washer/dryer. Rooms: 6 Bedrooms, 2 En Suites, 1 Bathroom, 1 shower room, kitchen/breakfast room, dining room, sitting room, garden/games room, utility room, dayroom, conservatory. Beds: 1 super king, 2 king size, 6 singles. Other: Books & games, radio, hairdryer. Travel cot, highchair and stairgate. Outdoors: Large gardens with lawn, mature planting leading to river and private moorings. Enclosed Terrace with charcoal barbecue, table and chairs, separate paved area with hot tub. Access: Double garage and driveway for six large cars. 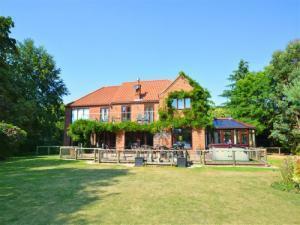 Four Seasons is a delightful detached property in a stunning riverside situation , just a short distance from Norwich city centre and the Norfolk Broads. The house accommodates up to 12 guests but discounts are available for smaller parties of 8 or 10 who wish to benefit from this lovely property and its location.